Allan Block Three is the wall of choice on this project. Building landscape walls in the native sandy soil, Real Escapes was able to build the walls with the more vertical three degree setback. 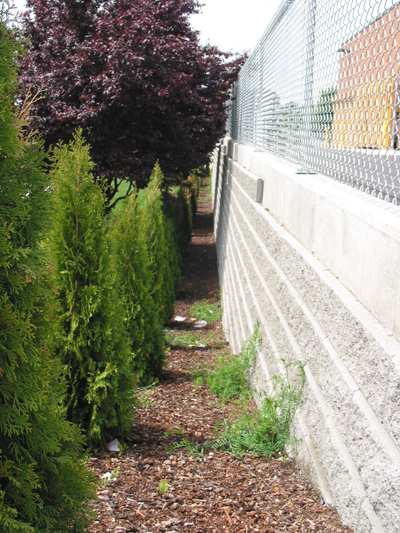 For taller walls, geogrid reinforcement was used to add stability to the soil behind the walls. When Trent Avenue was widened, it left a 2 foot grade change between the sidewalk and the lawn. 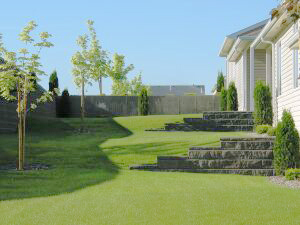 The AB Three was used to create a nice landscaped boarder for the lawn. The three degree set back was a nice choice in this application. The tiered planting areas that were created provide lots of color in the spring and summer months. Walgreens needed a retaining wall to support vehicle traffic through the drive through and around the south end of the building. 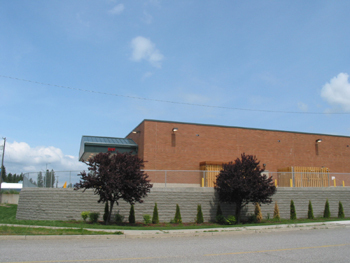 Paul Nelson P.E. of STI Northwest did the design and engineering for the wall. Dan Hughes, owner of Segmental Systems, and his crew did the installation. 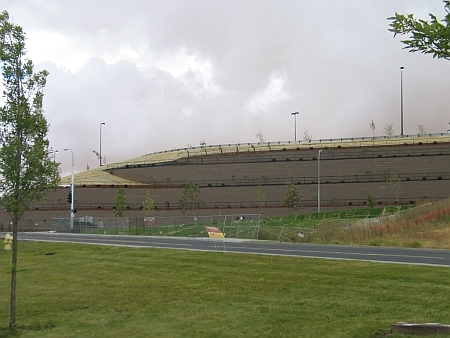 They used Raugrid 4/2-15 Geogrid to reinforce the soil behind the wall. 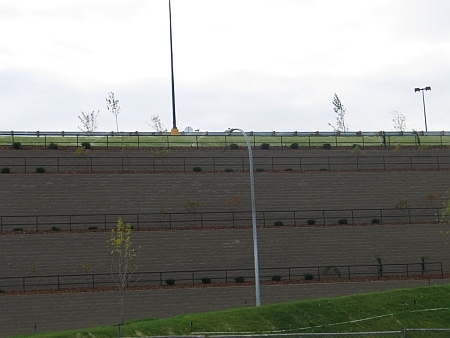 Segmental Systems installed over 3000 units with wall heights up over 9' tall. 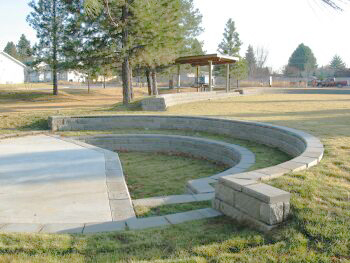 This park's design called out for a mini amphitheater. It was designed for the children of the neighborhood. 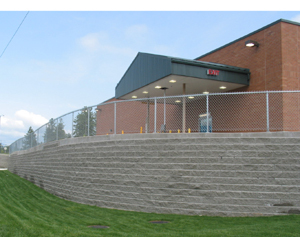 It was created using our Allan Block Three retaining wall block. The caps for the Allan Block are used for seating. Brown Contracting used the block to make the outline of the amphitheater and then poured concrete for the stage. 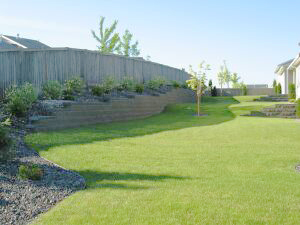 To create a level yard space, White Eagle Landscaping & Construction used the Allan Block Three retaining wall block. The wall was done in 2 phases and extends 1 city block. It is used to level out the yards for 2 new homes. 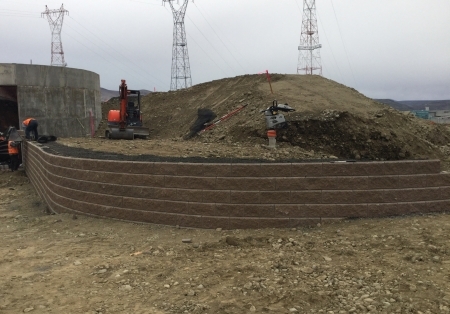 This project utilizes the Allan Block Retaining Wall System - AB Three in our Tan color. The engineer needed the more vertical three degree set back to create the most space available for parking at this site. There are 4 terraces built into the wall. Each terrace has a set back of approx. 15 feet to allow for plantings and to soften the overall height of the wall. 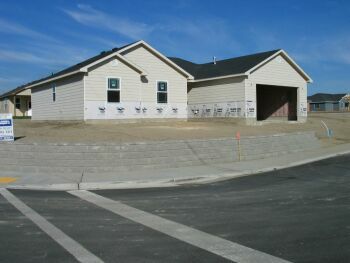 Overall this was a great project for Pullman Walmart, the installer and White Block Company. This was an upgrade to the visitor's area at the dam. There were numerous upgrades being implemented, including changes to the hisorical turbine shaft display. 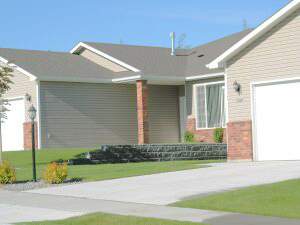 This project was specified with another product. The product was not available to the contractor at a reasonable price. We went in the Allan Block product as a value engineered product. We had to show that the set back on the AB Three would meet the overall effect that they were looking for, and that the Allan Block could be built nearly 18 feet tall without impacting other phases of the project. Once we submitted our calculations and our submittal information, we were approved. We had to manufacture the AB Three because it is a special order product. We were able to meet the installers time frame and with a little bit of training on the Allan Block Three, he was able to build the wall on time and on budget. 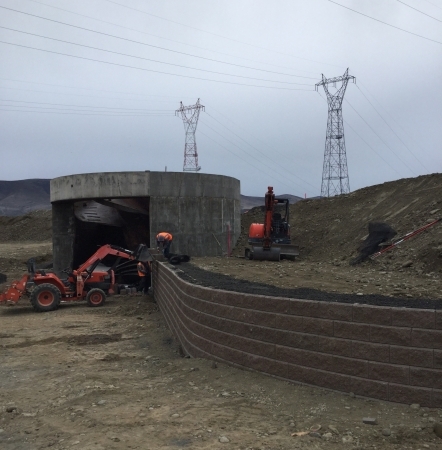 As he was finishing the project, he received many compliments from the Wanapum Dam employees at how beautiful the wall is, and that it had surpassed their expectations.